Neil - Is There A List Of All The Miners That Worked At Oaks Colliery? Peter Davies - Oaks Disaster - Where Are The Baker Family Buried? I’ve recently come across your site when researching my family tree. 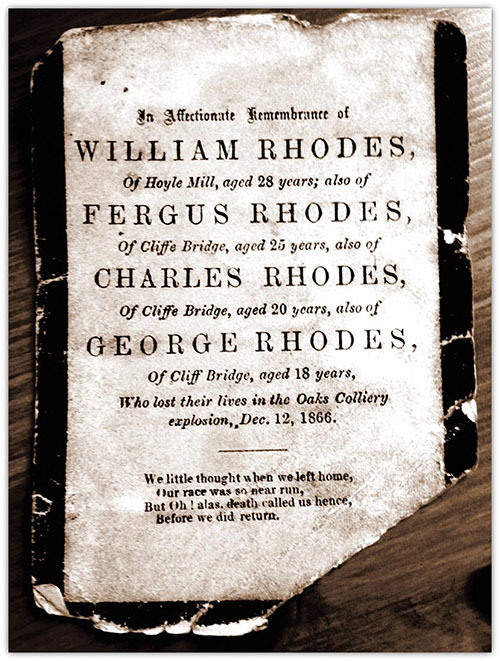 My Great Grandad, George Fergus Rhodes, was younger brother to William Rhodes, Fergus Rhodes, Charles Rhodes and George Rhodes, who were all victims of the Oak Colliery disaster. Attached is a photo of their memorial which may be of interest to your site. My name is Susan Gainey (nee Dickinson) and I have recently been finding out about my family tree. 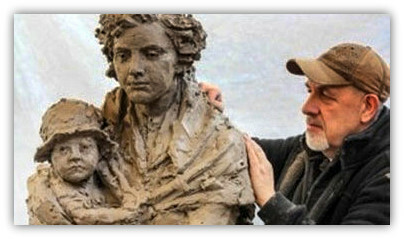 I came across the site healyhero.co.uk and found persons who I believe to be related to me mentioned as being the victims of the disaster at the colliery in 1866. However, I notice that William Rhodes 1838-1866 who I believe is my 2nd great grandfather on my maternal side is not mentioned in the list as are 3 of his brothers Feargus, Charles and George Rhodes children of Isabella Mckenzie 1811-1869 and William Rhodes 1811-1889 but his name is written on the publication given out with the Barnsley Chronicle. I wondered if you had any further information about this and I would be interested in learning more about the proposed Memorial to remember those who perished 150 years ago next December. Hi Susan, you are right, he (was not) in the list but he is in the printed list. I have amended the list. My great, great, grandfather Frederick Fletcher died in the Oaks Pit disaster in 1866 aged 22, leaving a wife and 2 children. I have the bible given to every family who lost a loved one in the disaster. Is There A List Of All The Miners That Worked At Oaks Colliery? Hi I was wondering if there is a list of all the miners that worked in the Oaks Colliery I am trying to find to surnames Jukes and Donovan I cannot find them on the memorial. I was told they worked there but can’t find any evidence. Oaks Disaster - Where Are The Baker Family Buried? 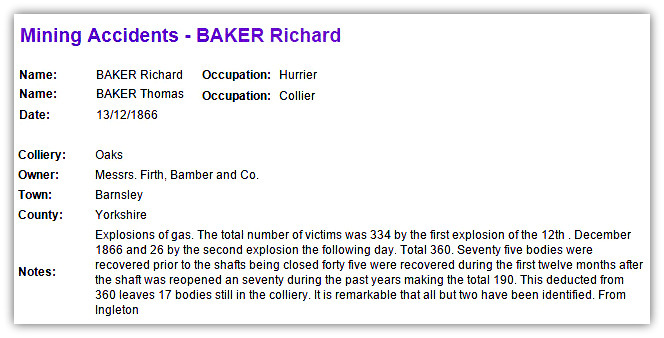 Do u know where the Baker family members killed in the Oaks Colliery Explosion 1866 are buried? I was trying to access the Oaks Disaster on the Disasters page but the link seems to be joined with the Talke 'o the Hill link. Clicking takes you to Talke 'o the Hill and the Oaks cannot be accessed through the link. The site is outstanding, so full of information and fact. Also I have found what appears to be an incorrect link. On Stuart Tomlin's Collection of Mining Pictures the link to Barnsley Main takes you to pictures of Bestwood Colliery. Thank you very much James for reporting the broken link, sorted now - and the Barnsley Main was a missing photo, I have now uploaded it. I am a descendant of a Graham family living in Littleworth at the time of this disaster. My Great Grand Uncle John Graham perished aged just 12 years of age in that disaster. He was a pony or horse handler. I have his death certificate which though he died on the day of the disaster was only registered in March of 1897 when it was formally assumed that though the bodies were in the sealed workings, all were dead. I am curious to know when John's body was recovered as he is shown as being buried in St Pauls, Monk Bretton in the June of 1868 about 18 months after the tragedy. It is probably because the body was only recovered as late as that. Do you know of the existence of a record which says whose corpse was recovered and when? I am aged 75 and left Grimethorpe in 1959 to serve in the R.A.F. when only aged 20. I live in Lincolnshire these days and have researched our Graham history extensively. This bit of information would complete my record in respect of poor young John. John's body was recovered about 18 months later, 5th June 1868. Seventy five bodies were recovered prior to the shafts being closed forty five were recovered during the first twelve months after the shaft was reopened and seventy during the past years making the total 190, John being one of those. This deducted from 360 leaves 17 bodies still in the colliery. All but two have been identified.